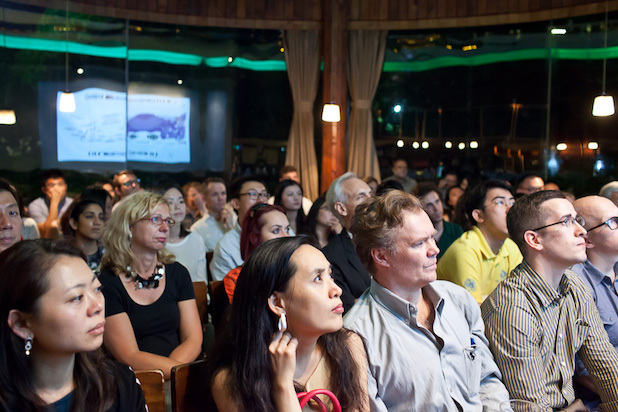 Shanghai Thinkery’s Frank Tsai Explains How Lectures Benefit Shy People—and the World! Frank Tsai, is the one man tour de force working behind the scenes of four lecture series: Hopkins China Forum, M Talks China, Shanghai Thinkery, and China Crossroads. 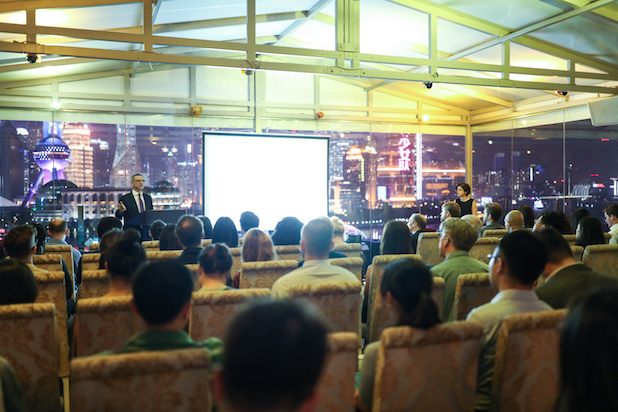 Altogether these series bring about 50 lectures to Shanghai annually, creating a community of those seeking intellectual stimulation. 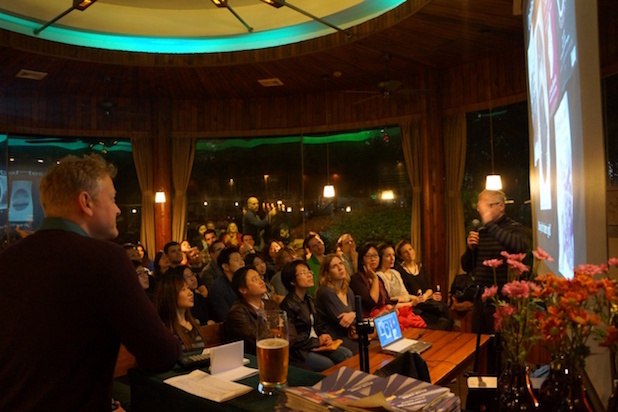 Ahead of an upcoming China Crossroads event tonight, SmSh sat down with Frank at his favorite bar to talk lectures, teamwork, and romance. Quick(ish) background: Hopkins China Forum, was the first of the lecture series Frank started, dating back to 2010. This one’s usually a little more high-brow, carrying the weight of the Hopkins name and is typically focused on China in an international context. Shanghai Thinkery’s kinda the odd lecture series out, anyone can speak at these events so you get some "out there topics" like ‘Dating in Shanghai from the Slavic Perspective.' M Talks China is done in partnership with 'cultural hub' M on the Bund (also host the Shanghai Literary Festival). And China Crossroads was founded this year, because Frank wanted to develop his own brand for more flexibility. SmSh: Take us back to 2010, why did you decide to start Hopkins China Forum? Frank: I had no idea I’d ever be a quote unquote events person, I’m not the kind of person who walks into a room, shakes hands and says hi. I don’t like parties too much unless I know at least three people…I run a book club, which predates this, goes back to May 2010, one day we were reading Daniel Bell, he was in Shanghai at Jiaotong University at the time, so we thought why don’t we just have him do a talk? Some of my bookclub members had contacts to get in touch with him, and we just did it…events started off infrequent then by 2012, I got into it. SmSh: What was the catalyst then to branch out and plan more events? Frank: I don’t plan too much, [after Hopkins China Forum] I inherited Thinkery from a friend who wanted a bigger turn out...I find so many people really want an intellectual or cultural life in Shanghai and they can’t find it; it’s because there’s not that much actually, even compared to Beijing. Especially if your an expat and you’ve just gotten here and you want to make some new friends it’s kind of hard. And I think the reason my [events] are so popular is because there’s just not that much else going on; and lectures are good too because…it’s all really focused on something really practical, you can chat with people and not have to get something out of it. SmSh: How do you find speakers? Do they contact you, you contact them or a little bit of both? Frank: For Thinkery, I just know all of them. For Hopkins China Forum, I don’t know all the scholars, so I cold email some, some the community suggests; maybe one fourth I write to and everything else just somehow comes to me. SmSh: What’s the draw like? Who’s usually at these events? Frank: Hopkins China Forum usually gets about 60 people in a crowd or so. M Talks China also brings a big crowd, but the biggest is Crossroads with an average attendance of 80. The average age is about 32—I’ve thought about this—equally returnees and foreigners; of the foreigners about half American, half European, so it’s a pretty diverse demographic. We also have a deceptively high level group that comes, because it’s very informal...it’s usually cheap or free, but diplomats and journalists show up…networking is part of it too. What I’m trying to do as a former academic, is bring academic ideas to a more general professional audience so it’s a good mix. It should be fun, in a nice venue, and you should be able to have a drink. SmSh: So solves that the party problem, huh? Frank: “Yeah [laughs]—but it’s good though if you’re a shy person, it really brings us out. It’s partly academic (especially the Hopkins China Forum is academic) but it’s a mixer too, you want to meet people—and you can quote me on this—I think a fourth of the people who come are just there because they want to meet a significant other—and I like that. Because let’s say you’re a person who cares about the gene pool, you want to have smart kids right? And that’s fine, you can want that and still enjoy the talks. No conflict of interest there. The next China Crossroads is this Thursday, September 7. Ioana Kraft, General Manager of the European Chamber of Commerce in Shanghai will be discussing the results from the European Chamber's '2017 Business Confidence Survey.' The talk starts at 7pm, at Cafe Sambal. There's a 80rmb cover fee. Networking and drinks after the lecture. Saturday, Professor Guy Alitto will be discussing his works on Liang Shu-Ming as a historical figure and how he relates to the 'Chinese dilemma of modernity.' The talk starts at 4pm, costs 85rmb, but 40rmb with a student ID. Find all info on past and upcoming lectures on the Shanghai Review.